The Material iPhone, iPod Touch, and iPad app creates a magazine of articles, videos, blogs, and online content based on your digital footprint. A quick sync of your Facebook and Twitter accounts leads to attractive feeds grouped into categories. The Material iPhone app feed may have an article from one of your existing social contacts, but it also pulls in information that may be relevant and complementary to your interests through its unique algorithm. Visually, the Material iPhone app nails it. The sign-in screen is a photo of the bottom of a pool with sunlight filtering through the water. The Facebook and Twitter icons are placed in the middle of the screen. With a tap, you authorize Facebook to access your basic profile info and list of friends. For Twitter, you authorize your account with a touch. At the bottom of the screen, you are advised, “We promise never to post on your behalf.” This is fantastic, as it streamlines the sync process and eliminates multiple pop-ups. You must wait a few minutes for your first Material iPhone app magazine to be created, but the wait is minimal and worth it. The feeds are bold and attractive, yet marked by a simplicity in design and thought. The name of a feed is framed in a bright colorful box at the top with the number of available stories tucked in the left corner of the colored box. 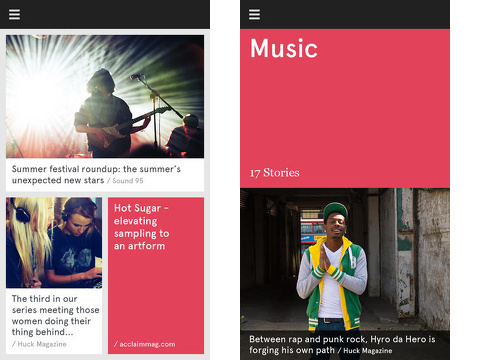 Then, you use vertical swipes to scroll through the list of stories. Each list has different sizes of thumbnail images, so the shape of the feeds change and adds fluidity. Each photo is labeled with the name of the article and source. 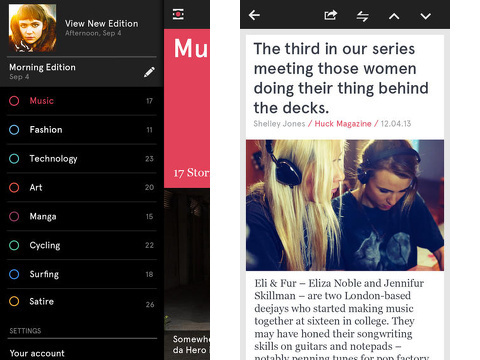 Each feed contains articles, videos, and content grouped by category. One category is automatically selected to be the opening feed. You simply touch the list icon in the upper left hand corner, and a list of categories slides on to the screen. You will find categories like music, technology, news, video gaming, comedy, and more. Each feed has a different color associated with it. The color is the same in the sliding left list and the box at the top of each feed. You touch an article to learn more. You simply find the content – free of ads and additional visual clutter. At the bottom, you may choose to read the online version from within the Material iPhone app interface. In the upper right hand corner of the content viewing interface, you will also find four icons. The up and down arrows scroll back and forth through the articles in the feed. The half arrow icon allows you to move back and forth between the online version and streamlined version of the content. You may also share through iOS sharing interface, as well as copy the link. The Material iPhone, iPod Touch, and iPad app combines relevant, intriguing content that you may not have stumbled across on your own with style and finesse. AppSafari review of Material: Personalised news, blogs & RSS stories was written by Jenni Ward on November 21st, 2013 and categorized under App Store, Free, News, Productivity, Social. Page viewed 4216 times, 1 so far today. Need help on using these apps? Please read the Help Page. A little confused this app, but very helpfully for me.